I had the best intentions to make this a pre-Thanksgiving, “Make this!” post. Alas, it wasn’t meant to be. So, I’ve miraculously transformed it into a post-Thanksgiving, pre-Christmas, “Make this!” post. Genius! If I was banished to a desert island and was allowed only one dessert, this would be it. 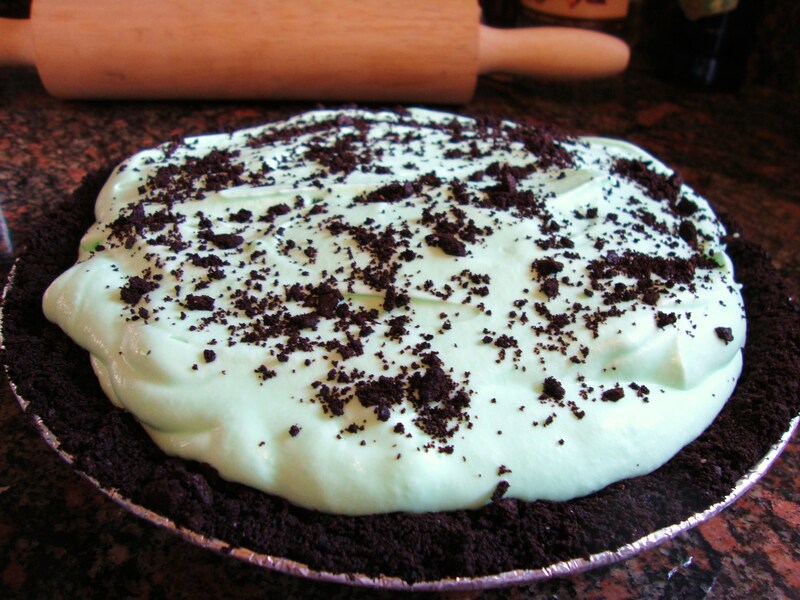 Grasshopper pie has been a stalwart at virtually every holiday celebration with the Tanny side of my family, and it’s not Thanksgiving, Christmas or Easter without it. 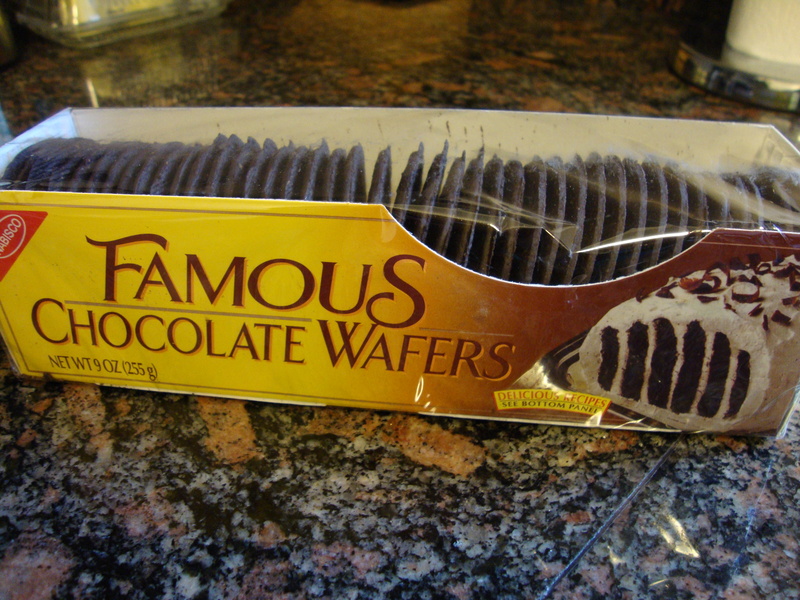 I have fond memories of sneakily checking out the fridge upon walking into my Gram’s house to confirm that it was securing resting inside, ready for consumption. My grandmother makes the best grasshopper pie, hands down. It’s the perfect combination with its rich, chocolate-y, buttery cookie crumb crust, juxtaposed with the fluffy, slightly minty filling. Don’t get me wrong — it’s filling. I’ve put that to the test. But not in a super rich, fudge sort of way. More like an “I really want to eat another piece…I might be able to fit it…well maybe not…eh, I’ll give it a go” sort of way. It’s fair to say that these are probably not going to be easy to find at the grocery store. But they’re there. Believe me. In the cookie aisle, they are usually up on the top shelf, and easy to miss. When I bought them last week, the grocery store clerk actually asked me what they were. Apparently she hadn’t seen them before. So there ya go. The secret is out. Important to make this in a glass pie plate so you can microwave the crust to set it. Otherwise it will be crumbly and won’t hold together. I learned that the hard way. Another key is making sure you melt the marshmallows ALL the way. Keep stirring and melting until there are no lumps. Otherwise you’ll have unpleasant pieces of chewy marshmallow in your pie, instead of a smooth, creamy, minty filling. And let me specify — it doesn’t taste like marshmallows. Or whipped cream. It somehow becomes its own identity. And a yummy one, at that. I hope this brings you as many delicious memories as it has brought me. Bon appetit! Melt butter. 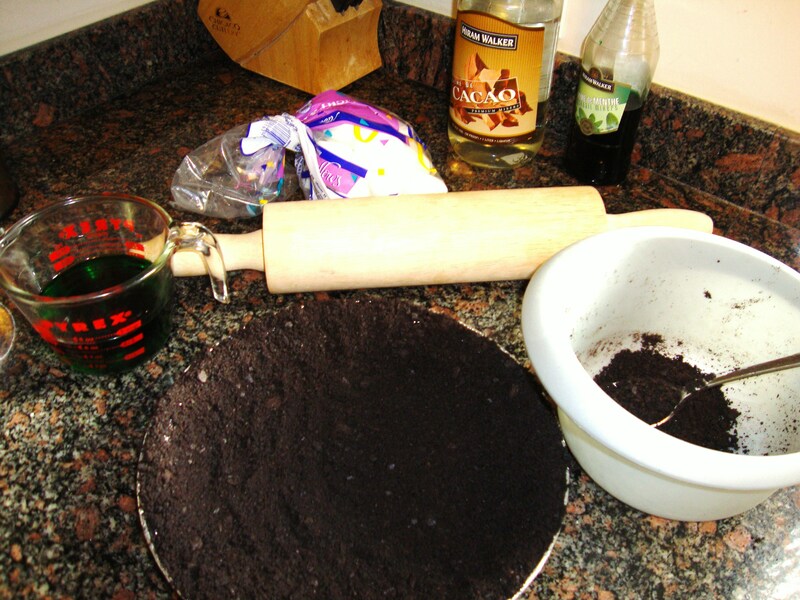 Stir in chocolate crumbs. (Reserve some for topping.) Press into a 10-inch pie plate on the bottom and up the sides. Microwave 2 minutes. Cool. 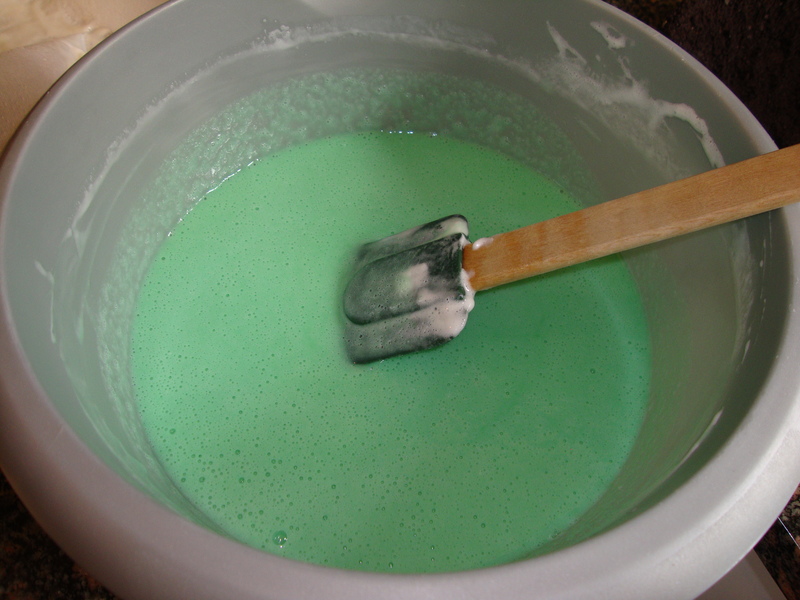 Melt marshmallows in milk in the microwave, stir until blended and no lumps remain. Mix in liqueurs and chill 20-30 minutes, stirring occasionally, until it starts to thicken. Fold whipped cream into the thickened marshmallow mixture. 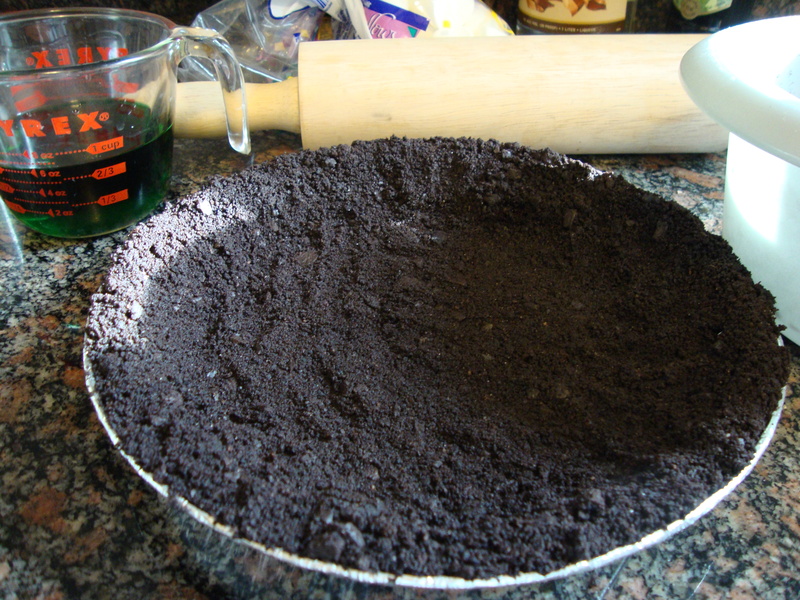 Turn into cookie crust. Decorate with reserved cookie crumbs. Refrigerate or freeze. How good does that look? 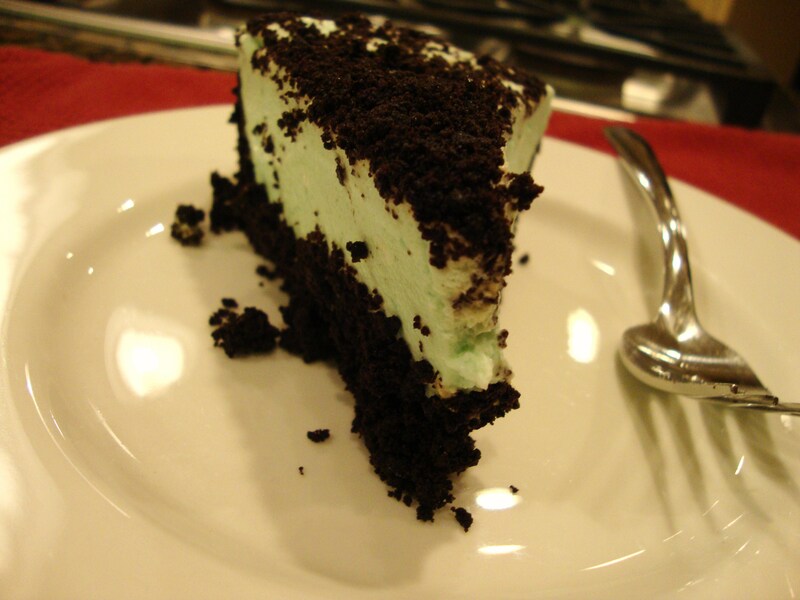 This entry was posted in Recipes, Uncategorized and tagged dessert, grasshopper pie, no-bake pie, pie by Tricia. Bookmark the permalink. I can’t believe I’m looking at pie so soon after Thanksgiving but this one stopped my in my tracks! Looks so good! ….OK, I have to stop looking now. 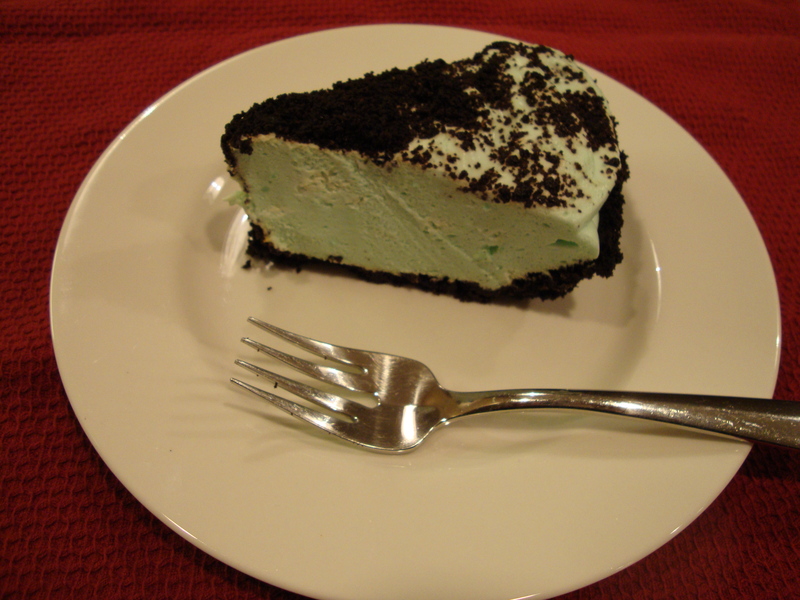 Grasshopper pie always makes me think of you, Hil! I’m making this tomorrow night! I’ll have to make two so other people can have a bite. Thanks for the recipe! Love! Can’t wait to hear how it turns out! The pie was a hit! Easy to make, even for a kitchen novice like me (although I will admit to one teeny tiny marshmallow explosion in the microwave). You are a wonderful, fattening, inspiration!